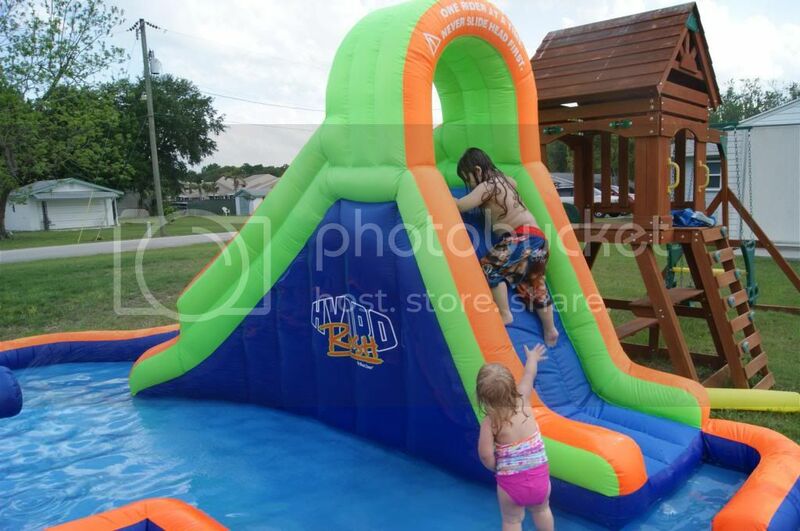 Blast Zone Hydro Rush Water Park Review and Giveaway! 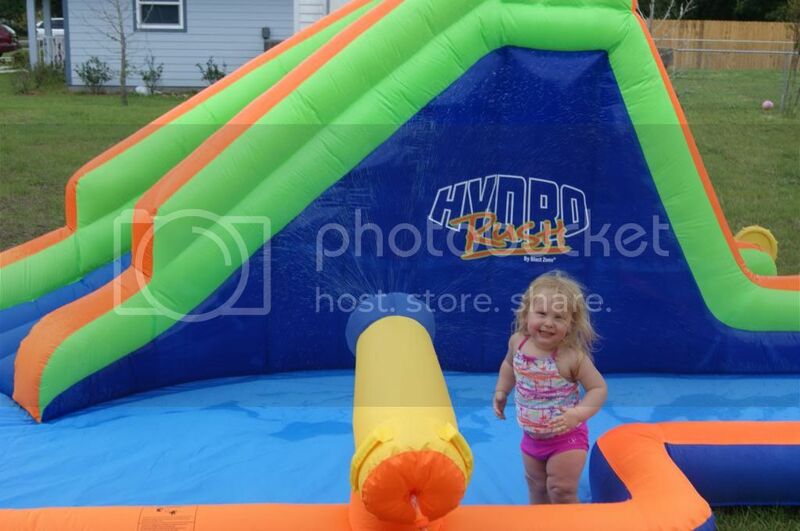 Blast Zone Hydro Rush Inflatable Water Park Review & GIVEAWAY!! I know in some places, Spring weather seems to be MIA, but here in Florida, the heat has arrived in full force. In fact it seems to have brought backups too. It is really hot. The humidity here is so intense, too, that it makes being outside nearly unbearable. But with "nice" weather finally here, and with Summer Break coming up soon for my son, I certainly do not want to have to stay cooped up inside every day hiding from the heat. It is very important to me that my kids be active. They are both a little on the chubby side, and need all the exercise they can get to stay healthy. This is especially difficult to do considering that I have an 18 month old and a 5 1/2 year old with Autism(therefore very limited listening skills and danger awareness). I can never let either of them outside alone, and if one goes out, they both have to. It is not easy to keep them both close at once, especially considering that there is a road on 2 sides of our home(one being a very busy main road). 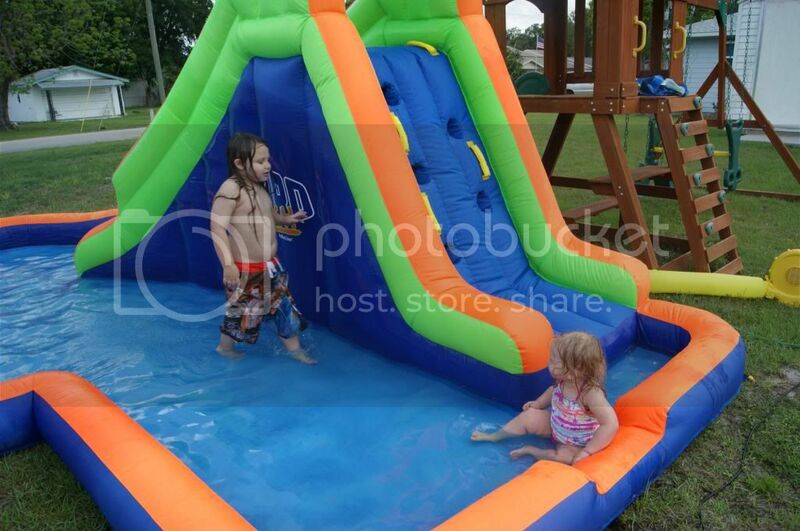 I needed something that would not only be cooling, but that would also keep both the kids contained and entertained, plus active. That is a very tall order to fill. I did a lot of looking around, and I found something that delivered on everything I wanted. TheHydro Rush Inflatable Water Park from Blast Zone is PERFECT! Not only is this a great kiddie pool with a large play area, but this also has a climbing wall and a water slide. PLUS a water cannon(sprayer). It is recommended for ages 3+, so my daughter is still on the young side, but I was right there, and(expect for taking a a few pics) I was actually in the kiddie pool part with them the whole time. The kids LOVE this. I set this up while my son was at school, so as soon as my son got home, he saw this. He ran right for it and wanted to play even though the water wasn't on and he was still in his school clothes. As soon as I let them in, they were already having a blast even though I had just turned the water on and it was still practically dry. 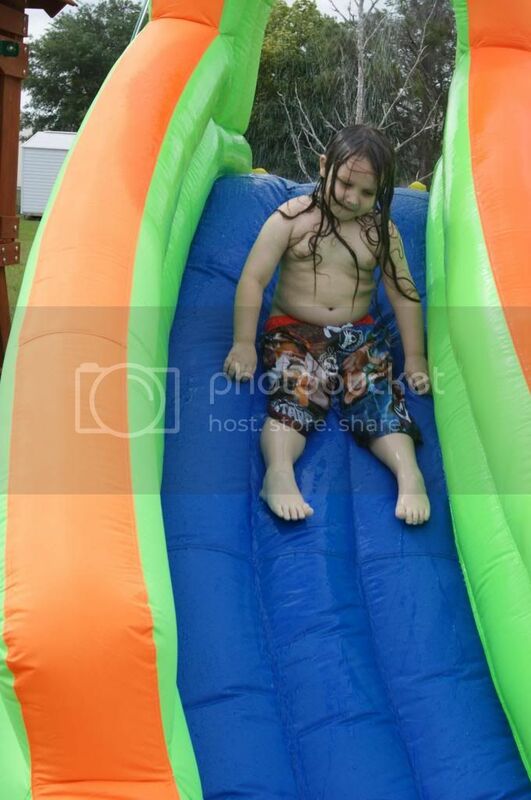 As much as my son loves the water, at first, he was afraid to get in the direct spray of water or to climb and go down the slide. He was pushing the "cannon" down just so he could walk past. It was so cute. He worked his way to standing with his back to the "cannon". I helped him climb the wall(made sure he know how to use the foot holds) and he worked his way up to getting to the top. 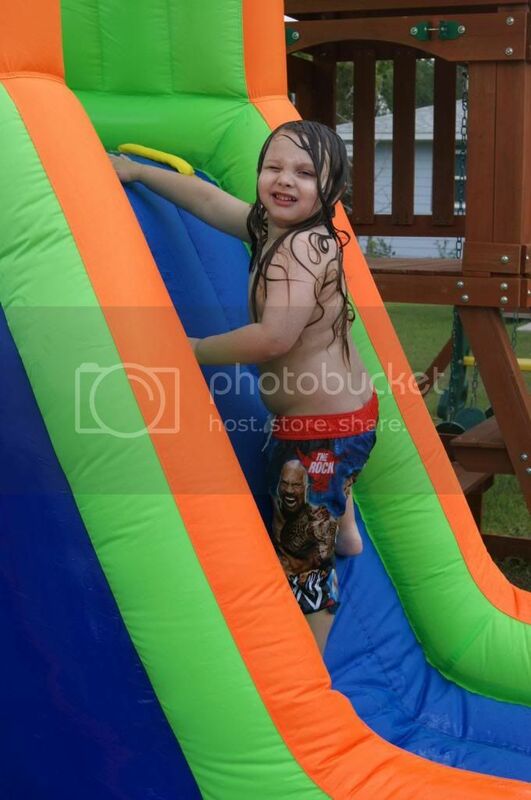 In no time at all, he was climbing like a pro(aside from nearly loosing his bottoms a couple times, lol). 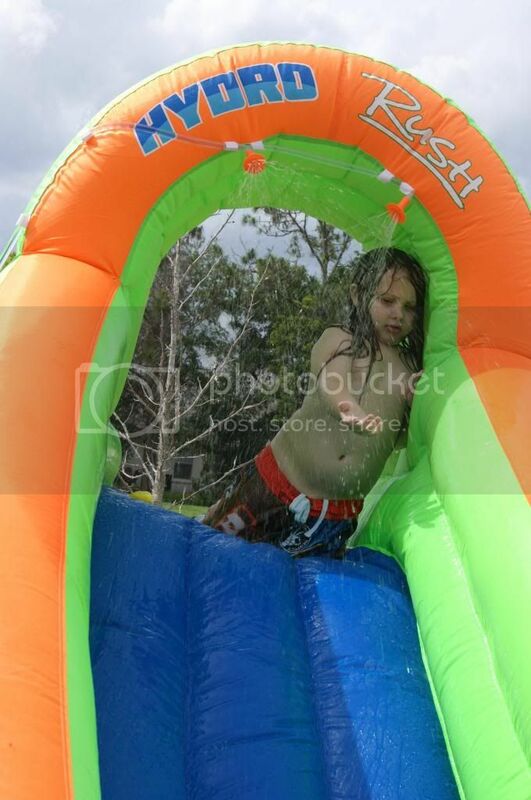 At first though, he was worried about the water getting on his face, and he would only go on his belly to avoid it. But with some encouragement, he gradually kept trying. 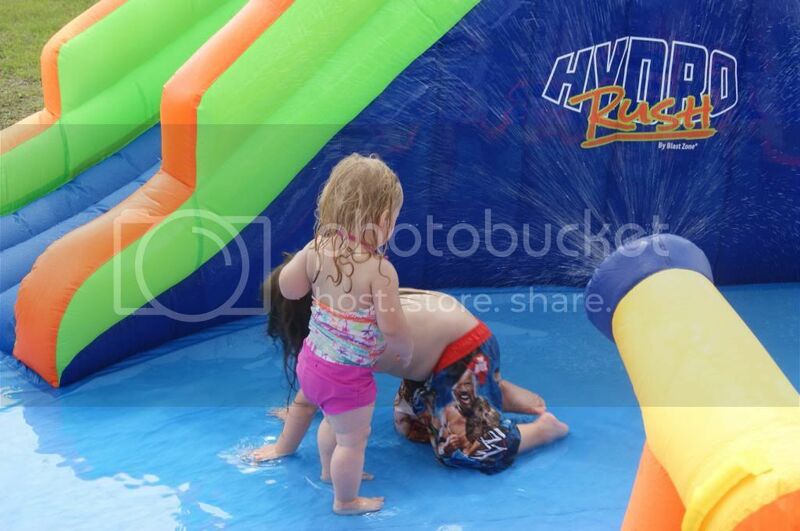 And then he only wanted to slide on his booty(face first through the water). I am so so proud of my little man for facing his fears and overcoming them. It may not seem like very much to most people, but it is a huge deal for him. I am so blown away by this. That aspect alone would EASILY be enough to make me love this product, but all the other great features make it even easier. And of course, not everything is about my son(even as thrilled as I am about his progress). 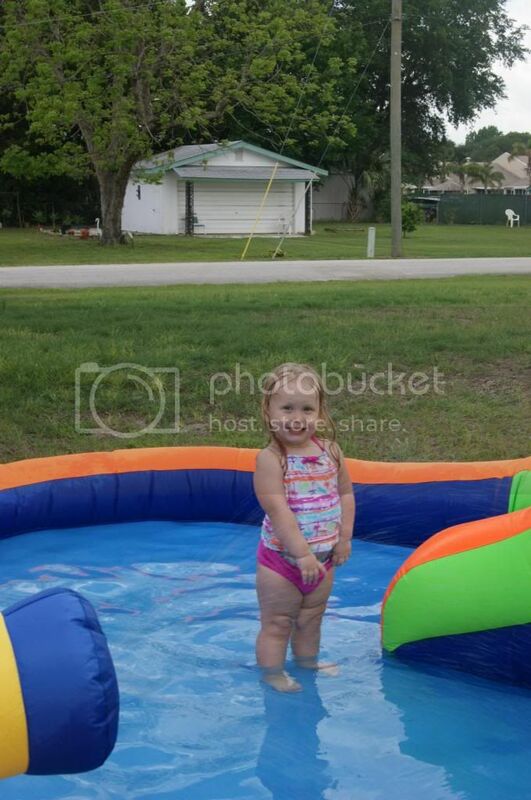 My daughter had such a blast too. She was trying to be a bit bolder than she should be though. She kept trying to climb up like her big brother. 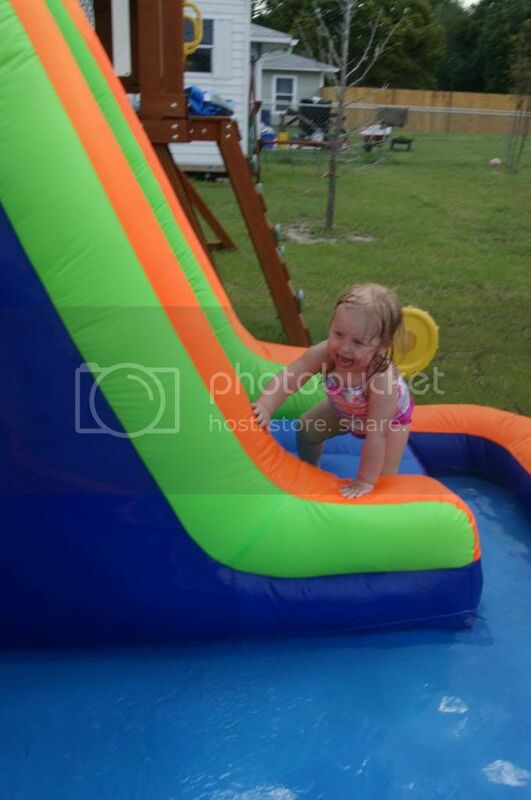 She actually got about half way a couple times and she was climbing up the front of the slide too. She's a little dare devil, but she kept trying to act innocent. This is probably the most fun that either of them have had in a very long time, and especially together. The usually fight each other, but they were actually getting along so well. I think they were actually enjoying playing together. 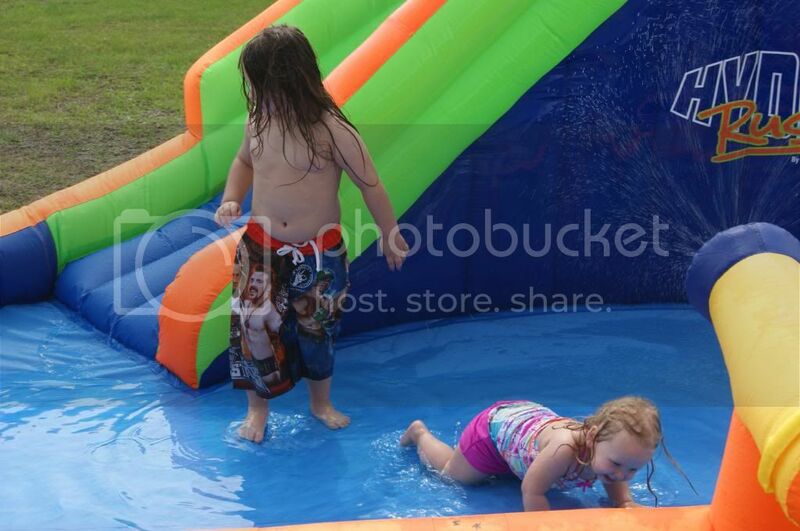 I am so happy that they are getting to the ages where they can have fun with each other. Aside from how much the kids love it, there are tons of other reasons that this Water Park is amazing. I love that the bower is included as well as the stakes, and even a patch kit. The pool area is nice and large so there is plenty of room for multiple kids. There is one lower area toward the back of the water park that keeps the water level from getting too high and makes it easier to empty. The climbing wall has foot(hand) holes AND handles to make it very easy (and safe) to climb. The material is ultra thick and durable. It will really hold up to any wear and tear that my monsters inflict on it. 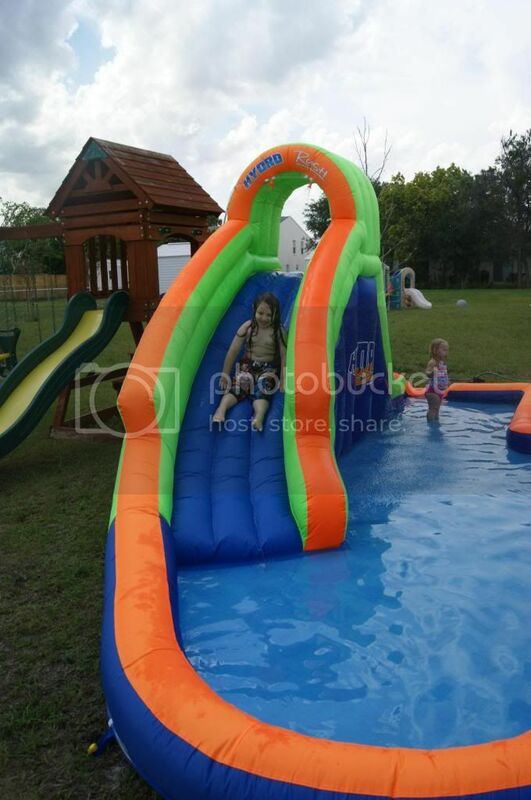 It is so fast and easy to inflate(and deflate), There are Velcro tabs going all the way from the top over the slide around the side to the "cannon" that secure the hosing. It only takes one hose to run both, and everything stays out of the way. It is so easy. I cannot think of anything at all that would make this better. Even the price is great. Such a great value for a product of this type with this high quality. This amazing Blast Zone Hydro Rush Inflatable Water Park has exceeded all of my expectations in every way. I highly recommend this super fun water park for anyone with kiddos and space. I know it will be one of their favorite things EVER! And one lucky family will be getting this super awesome toy for free. 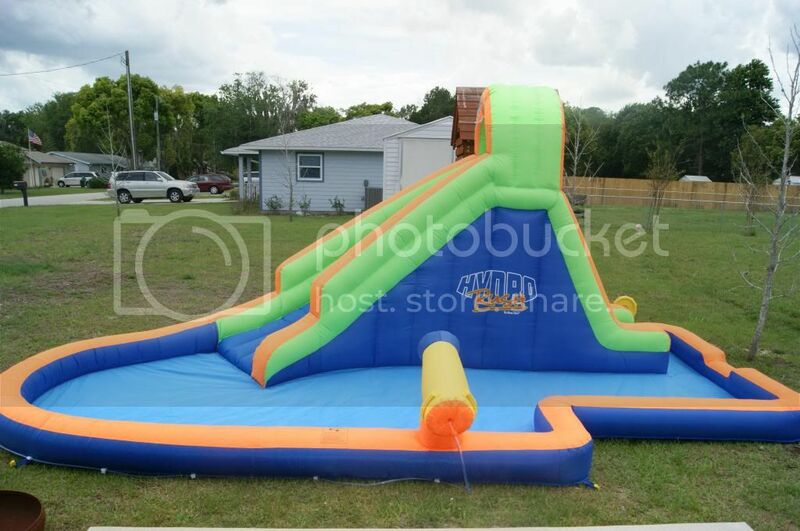 Just enter the giveaway below for your chance at the winning the Blast Zone Hydro Rush Inflatable Water Park. Good luck. 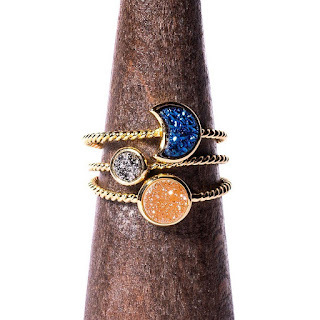 Another great review and giveaway brought to you by Andrea's World. 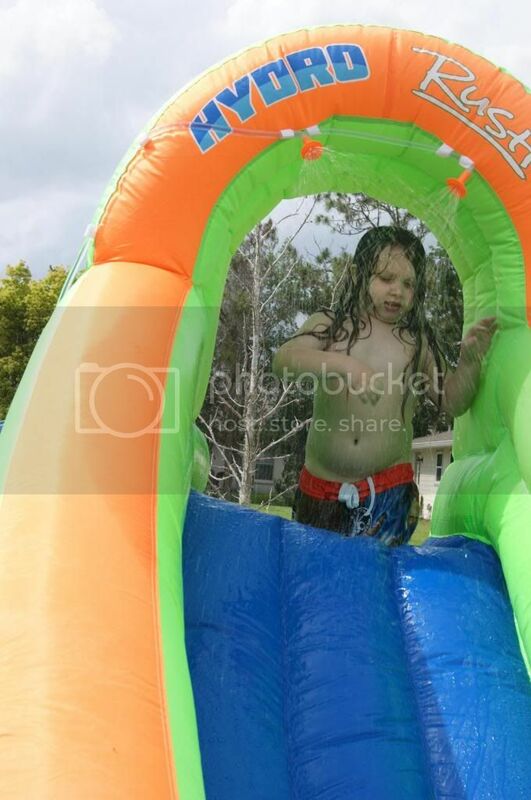 I love that it's a bouncy water park in your own backyard!!! My daughter will LOVE this! 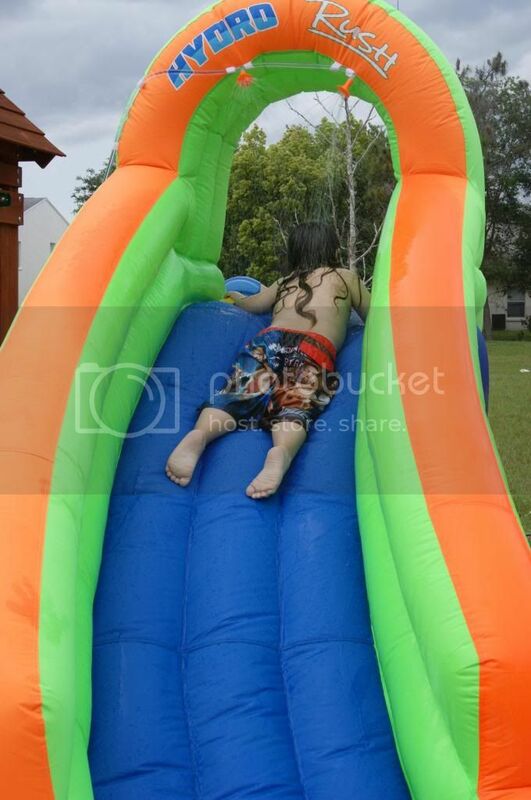 I like the way they have to climb using the holes, it's like a mini workout each time they go up to slide. My girls would LOVE this, it looks so awesome! I like most that it has different things to do so the kids will keep busy and get exercise. Looks like alot of fun! I have alot of little ones in the family that would go absolutely bananas over this! 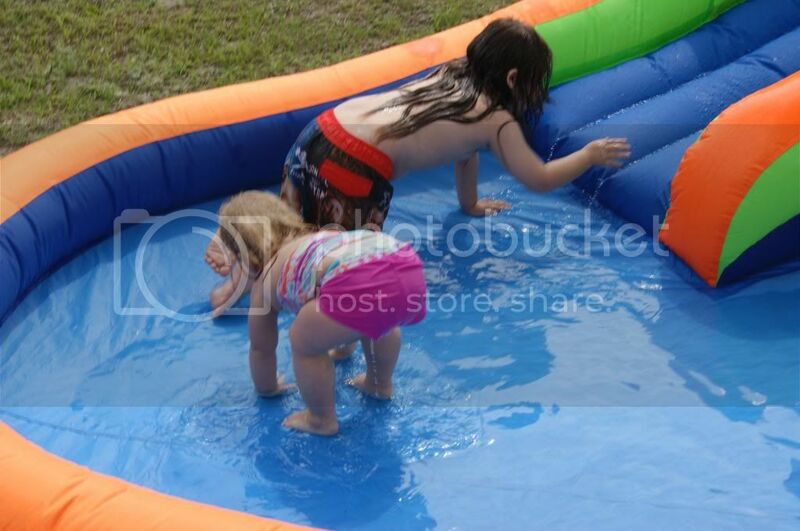 That it is fast and easy to set up, durable and thick material, and my son would have a blast. How fun! What a great way to spend the summer! oh my! i love your giveaway! I like that the depth of the water never gets to be too much! Your kids are precious! They are blessed to have you. Love the way you write about them! That looks like it would be so much fun, would love to win it. Glad they both had the fun! I think my kids will like to have it, too! a Very way to have during summer plus if you have a huge background where kids can play safe with that inflatable one. My kids would have a blast if we have one of this! I love that it's like a "soft" jungle gym with water! My daughter would have a blast! I love the size of this because it would be perfect for our yard. Plus my son would love playing in it. It would be nice for the family. I like the slide and the little pool it slides into. Would be nice for the backyard. My boys would LOVE this! It is already at 90 degrees outside today in NorCal! I am an adult and I want to play on that!so cool! What's NOT to love?! 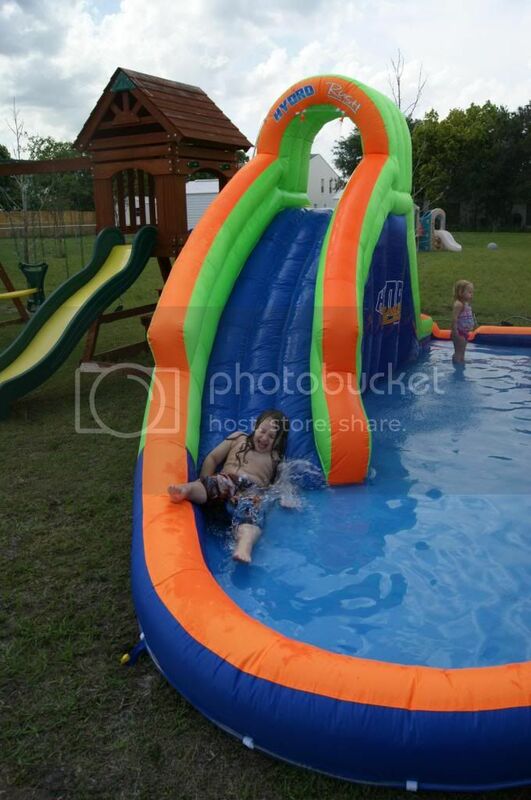 My son would love a water slide in our back yard! I love all the features, from the climbing of the wall to the slide and the pool area....LOVE IT. I love that it's fun in the sun in your own back yard!!! Love everything! My kiddos would love this so much! 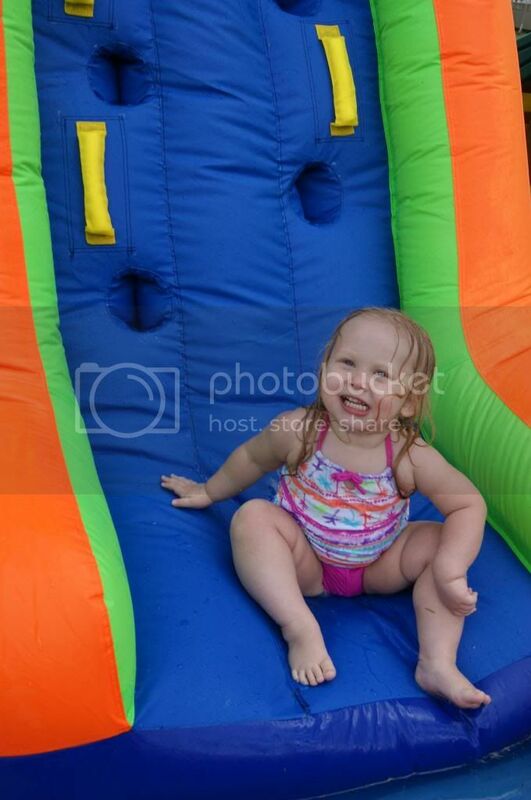 I love the slide and the sprinkler. My kids would love this!